The controlled source experiment investigates the Seychelles margin and its conjugate equivalent near the Laxmi ridge off the coast of India. 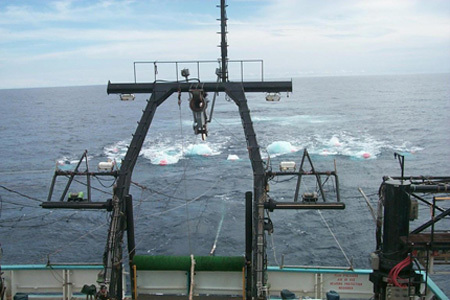 The RRS Charles Darwin, a British research vessel, acquired controlled-source seismic data in both areas during a period between late January and the middle of February, 2003. The source was a low energy, but finely tuned air gun array. The signals were recorded by hydrophones towed behind the ship, ocean bottom seismometers and seismometers located on various islands. Stations were deployed on Mahé and the surrounding islands, the Praslin islands, Bird and Denis. The portion of the experiment on the Seychelles side of the margin lasted ten days in mid February. Above - Map of ship track and land stations on the Seychelles plateau. Red circles show locations of short period stations and blue triangles show locations of broad band stations (all are 3-component). The straight black line shows the proposed ship track, whilst the more variable line shows the track that was eventually sailed due to shallow water around Ile Aride. 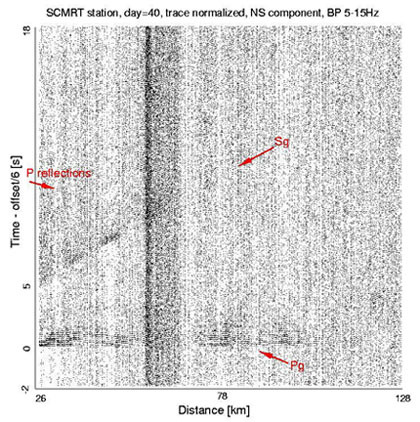 The plot above shows an example of the raw data in the form of a record section (common receiver gather). The example shows air gun sources recorded at a station on Mahé. Pg (Sg) refers to P-wave (S-wave) energy that propagates through the lower crust. Air guns behind the RRS Charles Darwin.